To sign up to the Bunn Leisure Newsletter, simply click the Request Newsletter button below and you will receive amazing special offers, discounts and access to secret sales. View the Bunn Leisure Online Brochure Now! Create lasting memories with your loved ones in beautiful holiday parks across the West Sussex coast. Bunn Leisure give families the perfect settings in which to play, relax and explore. These low cost breaks include whatever you want them to - from leisurely lounging on the beach, action-packed activities with the kids or relaxing with friends in your private backgarden. 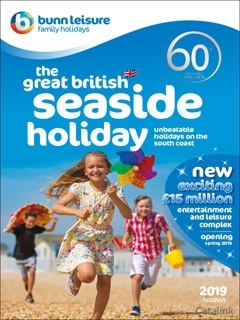 Incredible value on summer holidays, half-term breaks & weekend getaways! Enjoy evening entertainment, indoor pools, activities, games, green spaces & more! Sign up and be the first to know about the latest holiday offers and spectacular savings from Bunn Leisure! By Pressing the Request Newsletter button you give Bunn Leisure (and their Data Processors for the specific purpose of delivering your emails) consent to send you their newsletter via email until such time as you choose to unsubscribe.